Dominic's Journey, Mom's Journal: Hiking - again! Friday as we were driving from Camp to Therapy, Dominic pointed at Palmer Park going by on our right and said "Mountains". 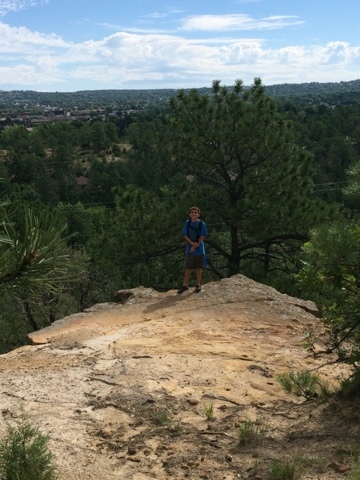 Mind you, just last week when my friend was here, we went hiking with Dominic and both dogs in Palmer park for the first time this year. So I asked him, "Do you want to go hiking in those mountains"
So this morning off we went - this time only taking Kama. Who, with treats, is now getting in the car without a fight - tho not enthusiastically just yet. 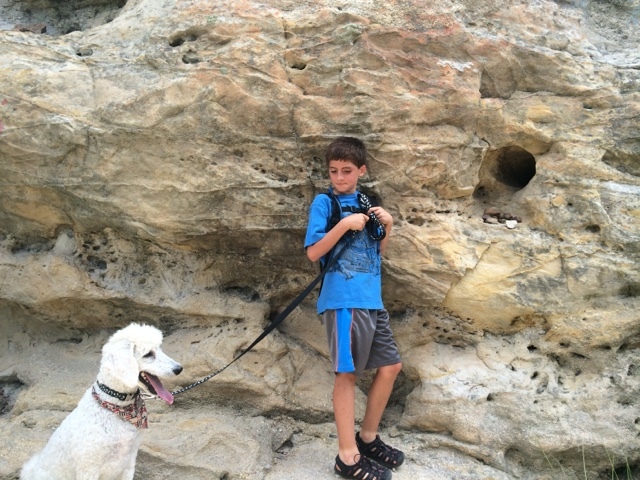 When we got to this hole in the wall - Dominic stopped and yelled into it. Not really sure who he was yelling at, but we all took the opportunity to take a water break. 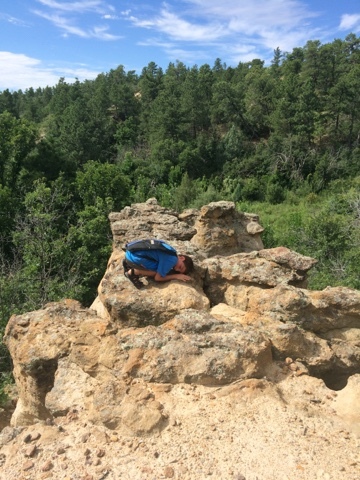 What is particularly funny about this pose is that its the very same rock that we all planked on last week. And he did this spontaneously, clearly waiting for me to take his picture. So I did. Total Ham. He walked down to this rock, turned around and posed. Such a turkey. I am going to have to go find some better hiking shoes if this is going to become a trend. I kind of like the trend - it makes me happy that 1. I can physically do this again (yay IonCleanse by AMD!! ), 2. That Dominic enjoys it and 3. That Kama enjoys it.